The MonkMartyr Galaktion of Vologda: Fearing the wrath of tsar Ivan the Terrible, kinsmen of the disgraced prince Ivan Ivanovich Bel'sky secretly conveyed his seven year old son Gavriil (Gabriel) to the city of Staritsa. In the years of his growing up, and seeing the malice of the tsar towards his family, the young prince withdrew to Vologda and settled in with a shoemaker, from whom he learned the cobbler's craft. And his marriage was not for long, since his wife soon died, leaving prince Gavriil to raise his infant daughter. The adversities of his earthly life strengthened in him the intent to devote himself to God. Having sought out a place at the River Sodima, he dug himself a pit and made his cell round about a church in the Name of the MostHoly Trinity, and having taken monastic vows with the name Galaktion, he began to asceticise in fasting and prayer. The ascetic did not give up on his cobbler's craft, and the money which he received from the work he divided into three portions: one part he dedicated to God, another portion he gave to the poor, and the third part provided him sustenance. Advancing in spiritual life, the Monk Galaktion secluded himself in his cell, having chained himself to the wall. God-fearing Christians provided him food through a small window. The ascetic rested little, on his knees and holding on the chain, and he ate only dry bread and water. In the cell of the Monk Galaktion was nothing, besides old matting with which he covered himself. People soon began to come to the hermit for spiritual guidance. And he received both the rich and the poor; his words were filled with spiritual power, whereof he consoled the grieving and brought to their senses the proud. In prayer the Monk Galaktion achieved an especial spiritual grace. One time, when the Vologda region had gone a long time without rain, bishop Antonii with a church procession came to the church of the Holy Trinity and dispatched a request to the hermit to pray together with everyone for deliverance from the common woe. The Monk Galaktion obediently left his cell and prayed in the church, and the Lord sent abundant rain upon the parched earth. The ascetic had a revelation from God about impending Vologda misfortunes. He emerged from his cell in his chains, went to an earthen hut and declared: "Sins have called forth the Poles and Lithuanians upon us. 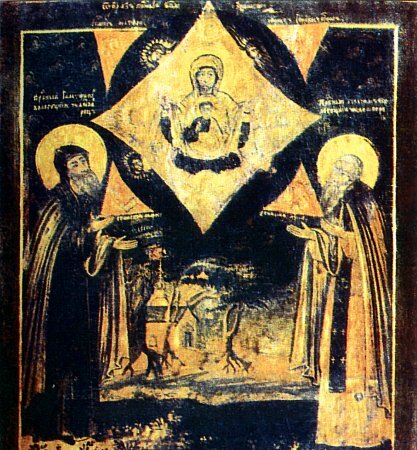 Let there be undertaken fasting and prayer, and preparation to build a temple in honour of the Sign (Znamenie) of the Mother of God, so that the Heavenly Queen as before Novgorod (the commemoration of the Sign Icon of the Mother of God of Novgorod is 27 November) might deliver Vologda from the wrath of God". One of those present, Nechai Proskurov, said: "Not for us, but for himself is he concerned; he doth but want to have a church near him. And what will become of the temple when thou die, starets?" The Monk Galaktion answered gravely: "Wrath is nigh to Vologda. As for me, there at my place God is glorified – and there also wilt be built a monastery", – and he said moreover, that the Trinity church built by Nechai, would be burnt and the house of Nechai laid waste. And going on past the church in honour of the Monk Dimitrii of Prilutsk (Comm. 11 February), he said: "The Wonderworker Dimitrii hath prayed the Saviour for the city, but they pay him insult – around his church they set up shops and noise about their wares. And this church wilt be destroyed". The prophecy of the righteous one was soon fulfilled. In September 1612 the Polish and Lithuanians stormed into Vologda, and they killed many of the inhabitants, they defiled and plundered the churches of God, and they set afire the city and its surroundings. As the Monk Galaktion predicted, the house and church built by Nechai were burnt, as was also the city church named for the Monk Dimitrii. The Monk Galaktion was murdered by the invaders on 24 September 1612. Pious Christians buried the body of the monkmartyr in his cell. Over the place of his burial began to occur miraculous healings. During the time of bishop Varlaam (1627-1645), over the relics of the MonkMartyr Galaktion was built a church in honour of the Sign (Znamenie) Icon of the Mother of God, and a monastery was founded. With the blessing of archbishop Markell (1645-1663), at the monastery was built a cathedral church in the Name of the Holy Spirit, and the monastery took its name from this church.